This one could have been rolled better, but you can't see the filling in the prettier ones. So I keep writing and rewriting this post. I have so much to share! In one I vented about my soul-crushing disappointment in the Democrats; and when I say vent, I mean lost my freaking mind. There was another one about my frustration with my job and about how freaking hot it's been lately. I considered instead taking a more positive route and typing your face off* about how I was flattered by our nomination for a VegNews Veggie Award this year that I got kinda choked up. Especially considering the fact we're up against some really awesome blogs that have been around forever and have huge followings... well, it's pretty amazing! Like a vegan food blog miracle! Thank you Baby Pizza! If you haven't voted for us - please do! We've also been tweaking things on here a bit here and there. I finally found a reliable email subscription service. So you can get Meet The Shannons sent right to your inbox now! The subscription box is in the right hand column. It's OK to get really excited about that. I will share that I plan to eat these all day with my salad or soup for lunch. I personally love a good lemony pesto. I mean, do you remember when we made those vegan Red Lobster Garlic Cheezy Biscuits? These rolls aren't as easy as those little buddies, but they're just as good. And in the end, that's what really matters. I included one of Betty's "Cheats" in case you want a short cut. Combine Yeast, 3 Tablespoons Warm Water and 1 teaspoon Sugar. Let it hang out and get all crazy like only Yeast and Sugar can party. Heat Soy Milk on the stove top till it's warm, but don't let it bubble or boil. Remove from heat. Dissolve 2 teaspoons of Sugar and Salt in the warm Soy Milk. Put 3 1/2 Cups of Flour into a mixing bowl. Pour warm Soy Milk mix into the Flour and blend with an electric hand mixer until smooth. Mix in the Yeast and Olive Oil. Then gently knead the dough until it is blended. Then cover the dough and let it sit for about 30 to 45 minutes until the dough doubles in size. Uncover and with your fist, gently press down in the center of the dough to deflate the dough. Recover and chill the dough in the fridge for 15 minutes. During that time, blend your butter with a hand mixer until whipped. You want it soft enough to spread but not oily and melted. Flour a surface and roller and roll out your chilled dough into a 14 x 8 inch rectangle. Gently spread butter over the 1/2 the dough. Fold the unbuttered dough over the buttered half. With your roller, roll the dough into a 14 x 6 inch rectangle. Sprinkle with Flour and then wrap in plastic wrap. Put back in the fridge and chill for 2 hours. Make your Pesto by combining all the ingredients except Olive Oil in a food processor or blender and blend for the count of 10. You just want it chopped not liquified. So be quick about it. Then with a spoon mix in the Olive Oil. Then roll your dough out on a floured surface into a 20 x 5 inch rectangle. Now try to make this cut as straight as you can. If you have one of those wire cutters that some use for cutting butter - you might want to use that instead. They are very handy for cutting dough for cinnamon rolls and make it easier to cut a straight line but can be tricky too. Cut the dough down the center so you will have 2 - 10 x 5 inch rectangles. That means you are cutting the longest side of the rectangle. Then cut those in half so you will have a total of 4 - 5 x 5 inch squares. Then cut those in half diagonally into triangles. Take each one and gently pull the corners out slightly to make longer points. Then brush your Pesto onto your triangles and roll them up. You'll want to roll them starting with the longer side of the triangle first and then gently shape them into crescents. Place them on a lined cookie sheet and bake for 12 to 15 minutes. Pull them out when they are golden brown. * The bloggers version of talking a face off. ** Yeah - I have no idea what that means but it made me laugh. Congrats on the nomination! 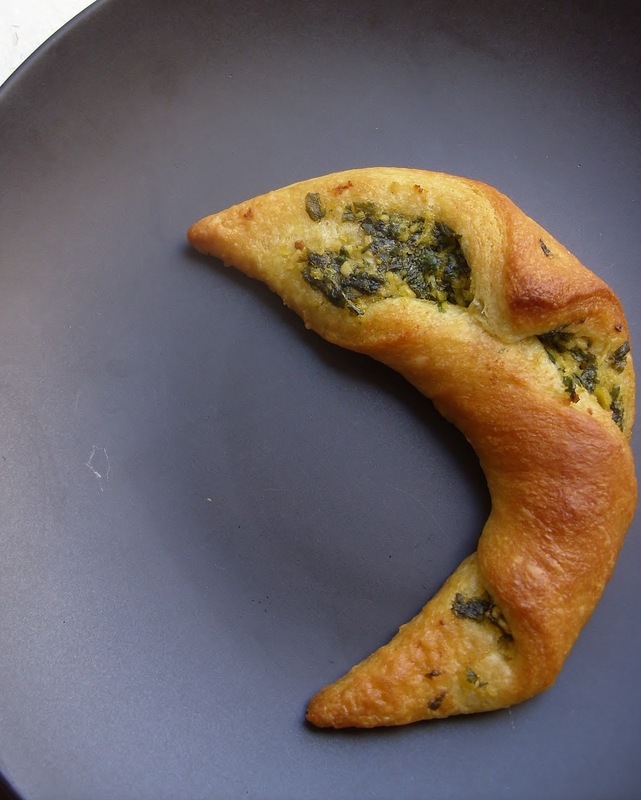 You have my vote - and the lemon pesto crescent rolls are a clever idea!